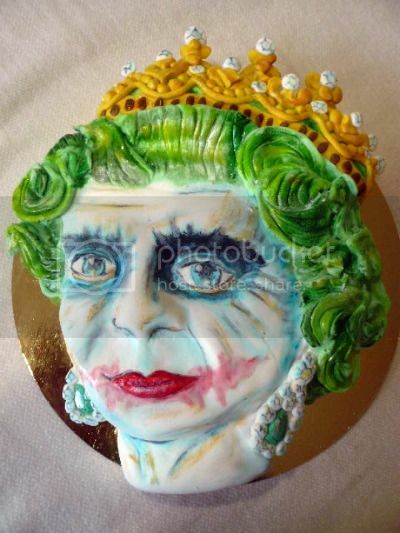 Credit Mila P. on Threadcakes for figuring out the just-right combination of colorfully-insane flavors (lemon cake, kiwi jelly, layers of chocolate and raspberry marmalade) to do justice to a cake–based on the “God Save the Villain” t-shirt–portraying The Joker as the mother-thumpin’ Queen of England. If I understand the translation of Mila’s description from not-English correctly, she used a “template” molded to look like the Queen’s face to shape the top of the cake. As in, she went to the store and bought a mold that could shape any pliable substance into the likeness of the Queen, should the need arise. Which it did. Which I find even more nutty than the idea of The Joker as the Queen. I will give so many finger-gun-salutes to anyone in the comments who can link to a mold of the Queen’s face. Found on shaped like Texas … but the Queen’s face doesn’t seem to exist ….. It doesn’t necessarily mean that she purchased a mold of some sort. She likely printed out a picture of the Queen and used it as a stencil to mark the features rather than just freehanding the entire thing.